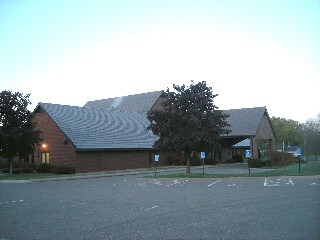 Saint Paul’s United Methodist Church is located a third of a mile north of the intersection of Hwy 62 and Dodd Road in Mendota Heights, MN. We are on the corner of Wesley Lane and Dodd Rd. We have a large parking lot on the east side of the church. Two entrances to the church are available from the parking lot – the east door will lead you through our Fellowship Room to the main entry. The main door will take you directly to the front entry. The church has only one floor, so there are no stairs and it is handicapped accessible. The worship space will be directly in front of you. If you enter by the main doors, you will be greeted by a member of the congregation. 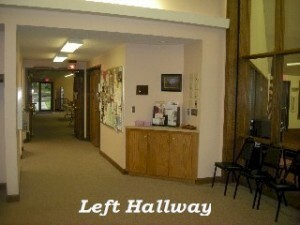 Once you enter the church through the front door, you will see that there are two hallways on either side. 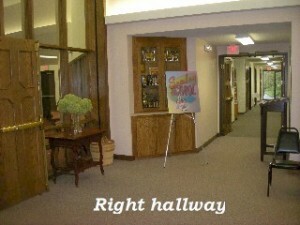 The right hallway takes you to the Education Wing, where you will find the Sunday School rooms, the Youth Group room, Nursery, Parents’ Lounge, and bathroom. The left hallway takes you to the Bertlesen Library. 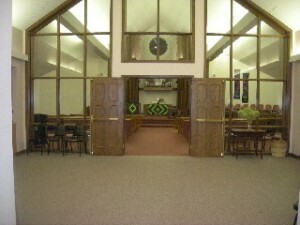 It has comfy couches and chairs and has windows that look out on the sanctuary. We use this space for meetings and classes. Across from the library are bathrooms and a water fountain. 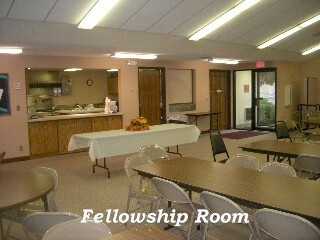 Then you will walk into our large meeting area, the Fellowship Room. There is a roomy kitchen off the Fellowship Room. Would you like a cup of coffee before the church service? You will find some in the Fellowship Room. Donations are accepted and benefit one of our local missions. On the second Sunday of every month, we roll out our Nametag Tower and ask all of our members to wear their nametags. There are blank nametags for you to fill out next to the tower. At the doorway to the sanctuary, someone (an usher) will hand you a bulletin and then you can find a place to sit. There is a screen on the left side of the room for the slideshow that follows the order of service. If it’s important to you to be able to view it, sit where you think you will be able to see it best. Once you are situated in your seat, open your bulletin and look it over. See the asterisk (*)? That means most people will stand. You may remain seated if you feel more comfortable. Anything written in bold letters means the whole congregation will repeat what is written. “Prelude” and “Postlude” are musical pieces played by the organist/pianist. If you lose your bulletin, don’t panic. You can always follow the service on the screen at the front of the church. There should be three books in front of you. The smaller book is the Bible. You may want to follow along with the readings during the service. 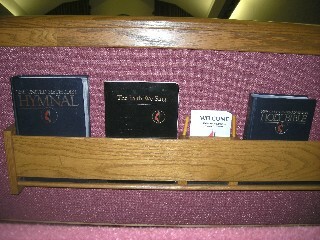 The larger book is our traditional hymnal. The smaller black paperback, The Faith We Sing, contains more modern songs. Some Sundays we use both. Some Sundays we use one or the other. It is noted in the bulletin which one the songs are in and the songs are posted on the screen. Approximately halfway through the service you will have an opportunity to greet the people sitting around you. It may be a simple nod of your head or a complete hand shake with the often-used phrase, “Peace be with you” (or some variation of the “peace” theme) or a simple “Good morning!” During the flu season, people will totally understand if you prefer not to shake hands. Children attending the service (and all the young at heart!) are invited to come up to the front of the church and sit on the steps while someone tells a story, uses props or whatever else might help to illustrate that Sunday’s sermon topic. At the end, children are dismissed to either return to their parents in the church or go to the Education Wing, where they will be supervised by an adult. The theme of the sermon will be noted in the bulletin. Pastor Amy Jo doesn’t stand behind the podium when she speaks. She likes to move around down by the congregation. So don’t be surprised to see her walking back and forth! We celebrate the Sacrament of Holy Communion the first Sunday of each month. St. Paul’s United Methodist Church welcomes to the table all who profess their love of Jesus Christ. You need not be a member of this or any congregation to take part. Participants are instructed by ushers to walk to the front of the church, take a piece of bread, then chose to dip it in the chalice or take an individual cup at the communion rail. You are invited to kneel at the rails if you wish. Tell an usher if you prefer to be served at your seat. There’s always an offering. As a first-time guest, you are exempt. As the offering plate is handed to you, just pass it along to the person next to you. If you would like to contribute, there are guest envelopes in the pew in front of you. Coffee is always available before and after church. Small snacks are also usually available. On the second Sunday of every month, we host a brunch. Sometimes it’s pancakes. Sometimes it’s sloppy joes. You get the idea. It’s good eats with good people. If you aren’t in a hurry, find a seat in the Fellowship Room and enjoy.